In the year 2000, my parents took my siblings and I on essentially a 2-week long “field trip” to the East Coast. I think that was our first major road trip as a family, and it was about as eventful and memorable as any vacation can be — from the 11-hour day of driving, to ending up returning home in a rental van. On that trip, we visited family in Maryland, our best friends in North Carolina, and saw numerous historical sites in between. On the third day of the trip, we stopped to see our first battlefield: Antietam! My dad is very interested in military history, and he wanted to introduce us to some of this country’s most significant battles by taking us to the sites themselves, with a very hands-on approach. It certainly worked, because the things I remember the best from history lessons are the places I’ve seen with my own eyes! 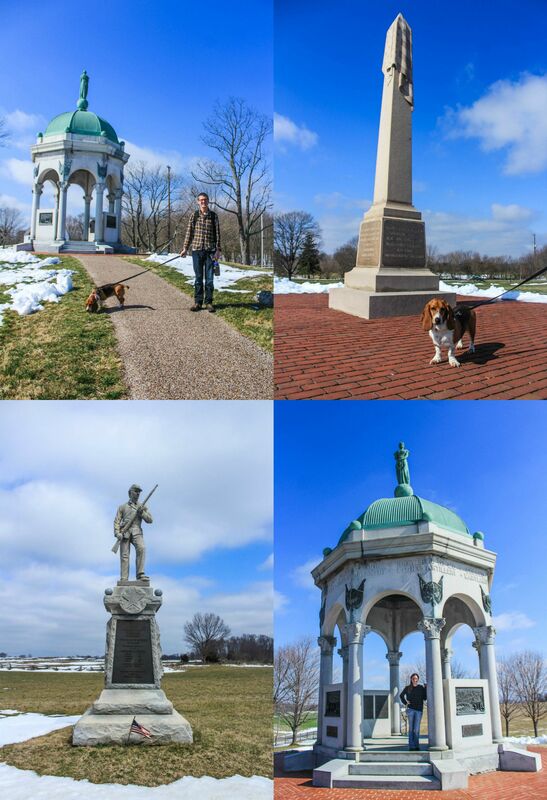 Antietam monuments and my favorite gazebo. ANYWAY — for today, we arrived at the battlefield late on a Saturday morning, and absolutely fell in love with the back countryside of Maryland on the way there. The rolling hills, farmlands, and winding country roads were quiet and beautiful — and what’s not to love about watching the temperature rise to the 50’s! That’s something we hadn’t seen in a while! While Gettysburg and Antietam are only an hour apart, there were way less visitors at Antietam (and a much smaller parking lot to match that!) We started at the visitor’s center, and walked around the short path to view the different monuments and Dunker Church. Then we continued walking down the road a ways to the cornfield, where we wandered about admiring more monuments and the beautiful hills behind them. We walked back toward the West Woods where we grabbed a letterbox before making our way back to the visitor’s center. There were plenty of short trails and ones you could make into a longer hike through the entire site, but we decided to do less walking today because we wanted to be sure to hit another historic site in the afternoon. After our walk, we drove to the Sunken Road/Bloody Lane and observation tower. Curtis and I climbed the tower to get a better view of the area while Charlotte waited for us in the car and cried. 🙂 We finished our time here with driving to Burnside Bridge. While the bridge has an eventful past, with over 500 Union Soldiers dying while attempting to cross it, it is very beautiful today. Another piece of history that remains from that fateful day is a sycamore tree on the East side of the bridge. We got out and walked across the bridge and read the signs, and thought about taking one of the 3 loop trails in this area but decided not to for today. If we had wanted to spend an entire day here, I think we could have easily with all the trails! The next part of this day will be continued in the next post. For those who enjoy Curtis’ history summaries from sites we visit, he will be writing one post for this whole weekend trip when he has time, so stay tuned for that!